Annabelle 2 Release Date, Trailer, Cast, Plot, Rumors, News & Updates: In 2014, we have experienced the fear in the theater when prequel of Conjuring titled Annabele was released on the big screen. The production house had also confirmed the sequel. Now according to recent reports, it was said that title of Annabelle 2 will be Annabelle: Creation. It needs not to tell that horror movie “The Conjuring” which was released 2013 was grand hit. The budget of that film was $20 million and It has generated a profit of $318 million. Due to this massive success, it paved the way for prequel Anabelle and a sequel “Conjuring 2”. This two was also proved to be blockbuster with the earning of $257 million with a budget of $6.5 million. Logo with the official title of the upcoming movie was recently released by the director of the film and hence, it is confirmed that title of the sequel will be Annabelle: Creation. 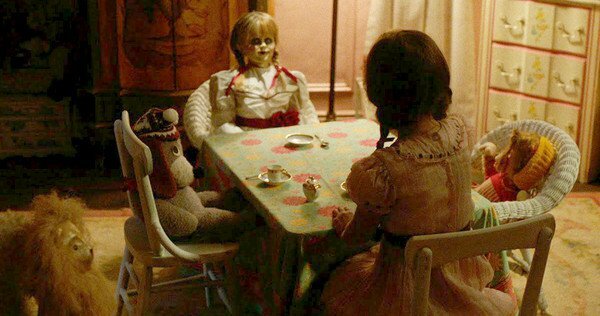 Though Annabele film had gained the profit of hundred of million which was the main reason for the development of Annabelle: Creation, but several reports also claims that first Anabelle was not that hit as it was expected. As per Movie Pilot reports, the upcoming movie will be made under the direction of David F. Sandberg who was also the director of “Lights Out”. It will hit the theater on August 11 this year. According to many film analyst, the teaser released before the official trailer is looking very impressive. Movie Pilot claimed that teaser itself seems to be better than the first Annabelle movie. Check: Bond 25 Release Date. In addition, the trailer revealed how Annabele was created. According to it, the doll maker and his wife lost their little girl in an accident. After several years of her death, the wife welcomed a nun and several girls from a shuttered orphanage into their home. The ghost as in the spirit of their daughter visits them frequently after the death of their daughter. Hence, the worried couple allowed the spirit to possess the doll. After some time they realized that that spirit was not of their daughter but it belongs to a demon and not their passed child, but it was too late by then. The possessed creation, Anabelle sets eyes on young Jance. Annabelle: Creation is slated to release on August 11, 2017, worldwide. Earlier, the date was May 19, 2017. Stay tuned to The Reporter Times for latest Hollywood movie news and all Entertainment updates around the world.